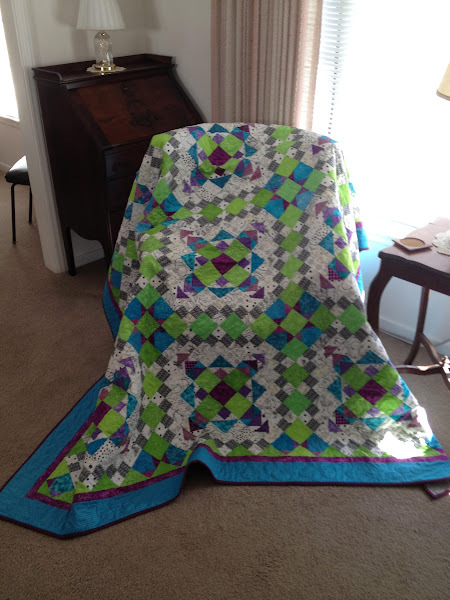 This is the first Keyhole quilt top I put together at the Fall Shipshewana Retreat in 2011. Made with a Bali Pop in Pomegranate. 54″ square. I like this one the best of the three I’ve made. Easy Street is finished. This is the 2012 Bonnie Hunter Mystery quilt. The pattern is only available on her web site until June, then it becomes part of one of her future books. So I won’t link to the page. I can’t believe I started and finished the quilt all within five months. The mystery started on November 23rd, 2012, the day after Thanksgiving. 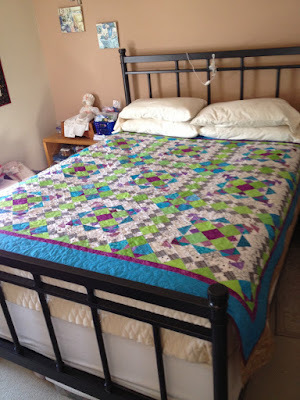 As usual, Bonnie’s quilts are a little too big for me so I made 3/4 of the number of units. As it turned out, for this pattern, I could have gotten away with far fewer units. So I made a second, mini version without borders, which will make a really cute baby quilt. I actually finished the mini-version first because it was so quick to put together. Every scrap of fabric in both versions is completely from my stash, mostly my 2″ and 3.5″ strip bins. 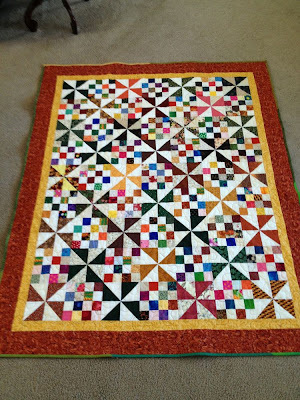 Even the 3.5 yards I used for the backing of the large version had been fermenting for quite a few years. Backing: Full size is a black on white all over feather patterned fabric. The 3.5 yards I had was not quite enough so I added a yard of purple down one side of the back. I like a slightly off center backing. The mini backing is a lavendar heart fabric. This is what it looks like on my queen bed laid over a cream coverlet. See more posts about these two quilts here. 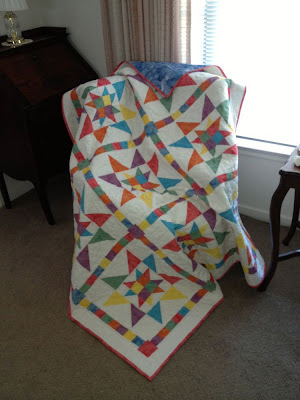 This pattern is free on Bonnie Hunter’s blog. I started making pinwheels using some pre-cut triangles that were in a scrap bag that I won in a blog giveaway. Lot’s of rectangles, squares, and triangles. 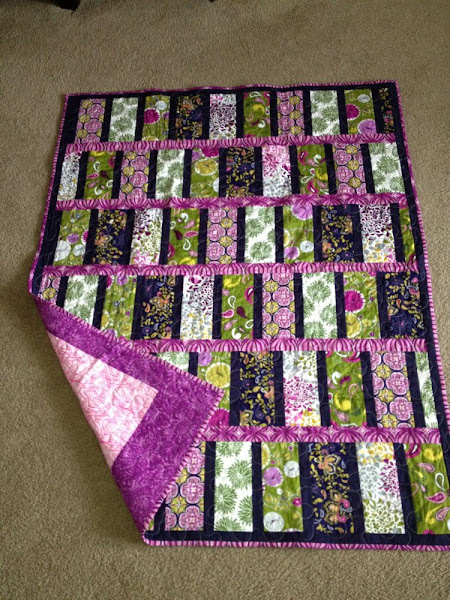 The fabric was not my favorite but I was determined to make scrap quilts from it. See my Scrappy Sassy Sixteen also made from these scraps. 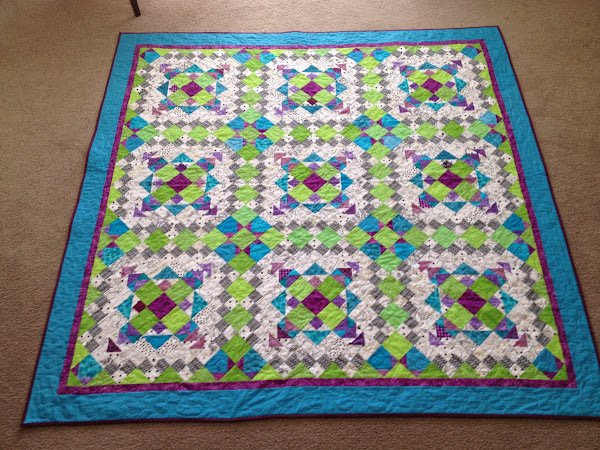 The blocks are 6″ and I used a 7 x 9 setting, 42.5″ x 55″. The cream is largely from an IKEA sheet. I added a 1.5″ gold border and a 3.5″ brown border to finish it off. The finished quilt is 65.5″ x 53.25″. The border looks wavy in the picture below but it really isn’t. For the back I used a cream on cream wide muslin. I’ve decided I’m not crazy about light backings. Shows every little glitch that happened while quilting. The batting is Cream Rose. This is the first time I tried it and I don’t like handling it. It is much thinner than Warm and Natural and it seemed to pull apart easily. I quilted an all over large meander using a YLI brown variegated thread on top and a cream on the bottom. 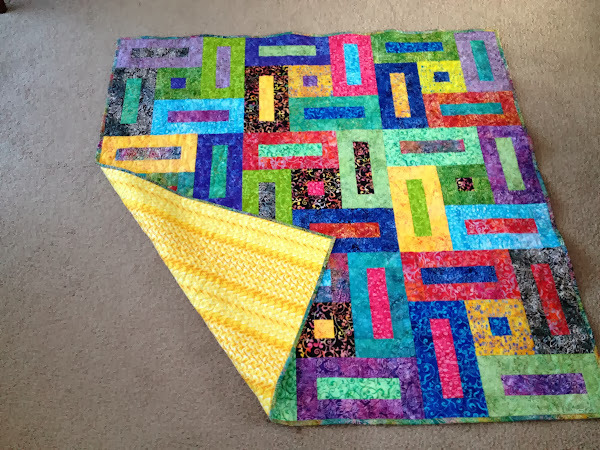 I used a bunch of green and gold left over binding strips to machine bind the quilt. 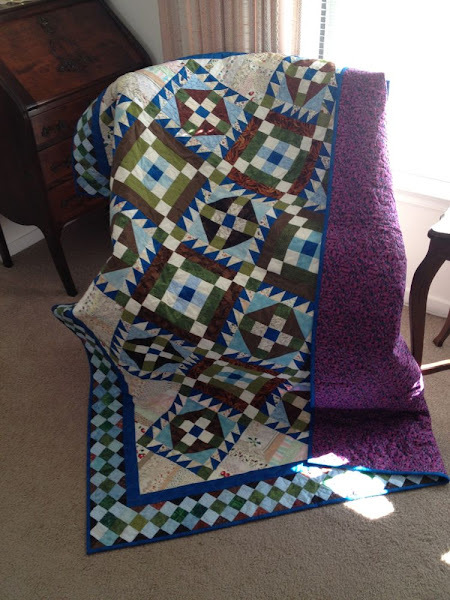 I had a lot of trouble quilting this on my Sapphire 850. Lot’s of broken and frayed thread and several broken needles. 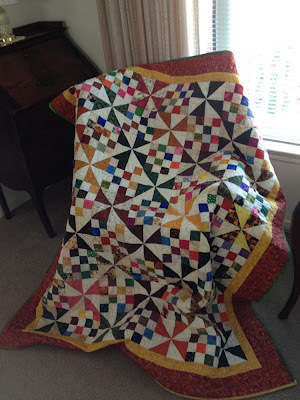 I’m not sure if it was the batting or the coarser muslin backing that was causing the problem, because I haven’t had this problem to this extent on other quilts. So there were a lot of thread tangles in brown on the cream back that I had to deal with. 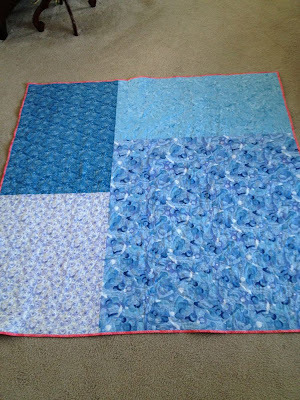 11/21/2012 – Sandwiched quilt with wide muslin backing.